The word ‘Saree’ originated from the Sanskrit language ‘Sati’ which means a strip of cloth. Every region in India has a distinct way of draping the saree. The unique style in which a saree is draped reveals a lot about the culture, tradition and region. A saree is designed in multiple ways. There are handwoven sarees, block printed, screen printed, embellished ones, etc. For example, the speciality of the Banarasi saree is that it is woven with gold, silver and zari threads while the Chanderi saree from Madhya Pradesh is completely handwoven with a combination of cotton and silk threads. There are sarees that are embellished with sequin and gota work. If you are looking for designer sarees, check out TheHLabel.com. HLabel offers an exclusive collection of sarees and other ethnic wear at affordable prices. Here are few sarees that you can check out from TheHLabel.com. 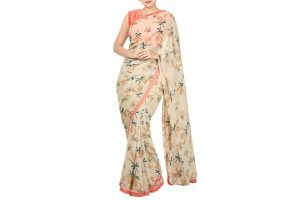 For those of you who prefer pastels can choose this light peach saree teamed with a light peach blouse. To enhance the look, team this up with a blue border and screen printed while the blouse is machine embroidered at the back and front. Dress in this lovely combo with a statement neckpiece to complete the look. Check out this designer party wear saree at TheHLabel.com. The orange blouse is embellished with mirror work and scattered beads. This is also teamed with an ombre saree embellished with mirror work on the drape. A stylish clutch purse is all you need to enhance your look. Don’t miss this gorgeous combo! The angel sleeve blouse is embroidered with French knot on the shoulder. This is paired with a peach and biscuit ombre georgette saree. The digital print stripes on the saree border enhances its look. Here’s another attractive set from the collection Sardi Ki Dhoop. The digitally printed georgette and cotton silk saree is teamed with a basic crop top. The crop top is cut from raw silk and the thread embroidery adds immense beauty to the top.